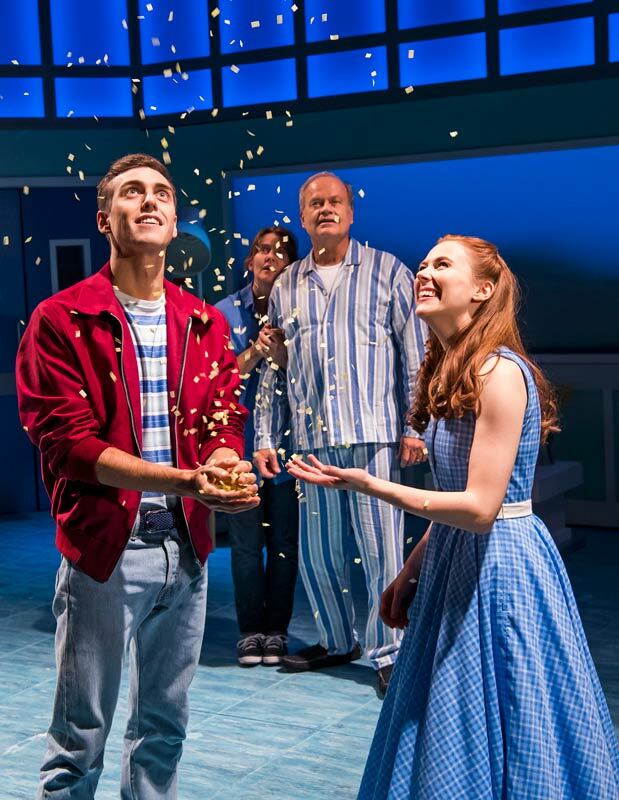 Big Fish is the latest musical to hit The Other Palace’s main stage and after watching the movie many years ago and loving it, I was excited to see what the musical version had to offer. The show, originally a novel by Daniel Wallace, tells of Edward Bloom, a dying man who has spent his life telling his son Will stories of his past adventures. These adventures range from his meeting of a fortune telling witch to his friendship with a giant. For Will the fantasy world and the reality begin to collide as he grapples to come to grips with his fathers death. The story is reimagined around Edward’s hospital bed in a clever twist on the story. The cast switch between fantasy characters and nurses and orderly’s from scene to scene adding an interesting dimension. At some points the ‘story’ needed to be more over the top and visually extraordinary, especially to provide a starker contrast to the ending. Kelsey Grammer is the star name attraction to Big Fish playing Edward Bloom. He played the affable elderly gentleman well with his charisma shining through however the real star of the show was Jamie Muscato as Story Edward. His energy and smile was infectious and he literally leapt and flew around the stage whilst singing soaring vocals. Matthew Seadon-Young played Will Bloom as a serious and stern son, contrasting well with Grammer and Muscato. The rest of the supporting cast were strong with special mentions going to Laura Baldwin as Story Sandra and Tanisha Spring as Story Jenny. These 2 actresses gave a smouldering performances and made Will’s confusion as to his fathers love interest entirely understandable. The music is forgettable and it is a long wait for the first song in the show. Much of the music does little to move the show on and often appears as an easy way for the fantasy side of the show to be explored. There are no numbers in Big Fish that have potential to be stand alone stalwarts and every successful musical needs one of these! The show does however have depth and the ending few scenes had many audience members sobbing. 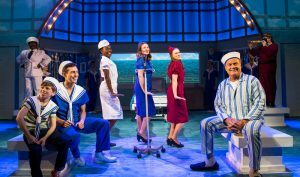 The simple understated, tenderness of the last moments of Big Fish provides this show with a real heart. Big Fish was underwhelming with forgettable music and a bigger vision needed to really make what is a touching story, succeed as a musical. To book tickets and find out more about Big Fish visit their website. If you liked my review of Big Fish you might also like my article about the Other Palace and its works in progress as well as my review of 35mm.